We all understand the basic principles underpinning marketing activity: to identify unfulfilled needs and desires and boost demand for the solutions a product is offering. The mantra is always "sell more". De-marketing tries for the very opposite. Why would a company actively try to decrease demand? There are many good reasons to do so: a firm cannot supply large enough quantities, or wants to limit supply to a region of narrow profit margin. Or, crucially, to discourage undesirable customers: those that could be bad for brand reputation, or in the case of the finance sector, high risk. De-marketing can yield effective solutions to these issues, effectively curtailing demand yet (crucially) not destroying it. Nevertheless, the fundamental negativity of de-marketing strategies often causes organisations to hide them from view and, as a result, they are rarely studied. This then is the first book to cast light on the secretive, counterintuitive world of de-marketing, deconstructing its mysteries and demonstrating how to incorporate them into a profit-driven marketing plan. A selection of thought leaders in strategic marketing mix theory with illustrative global cases, providing insight into how these strategies have been employed in practice and measuring their successes and failures. 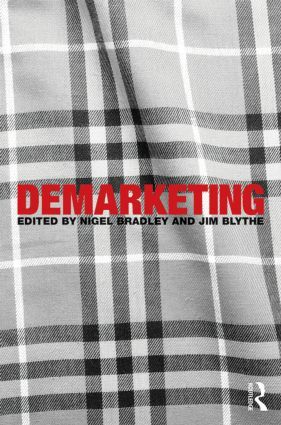 It’s a must-read for any student or researcher that wants to think differently about marketing.